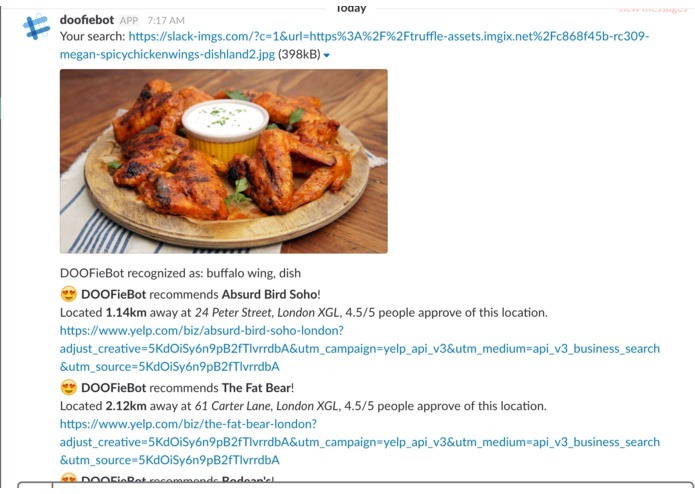 The latest iteration of doofieBot lurks on Slack, its backend built with Flask & powered by Amazon EC2. doofieBot makes use of IBM's powerful Watson Visual Recognition API to interpret pictures of delicious food queried by the user. After intelligently recognizing the food, doofieBot calls on Yelp Fusion to generate a list of nearby restaurants or businesses that serve or sell what you are looking for! doofieBot was built by a collaborative team of students from UBC (University of British Columbia) and UTSC (University of Toronto in Scarborough) for Hack the North 2017 (15-17 September). doofieBot was inspired by the fear of missing out on good food. what happens if your friend snapchats you a picture of a particularly good meal, and you start craving it too? by intelligently identifying the food and harnessing the power of a good restaurant analytics API, /doof is here to save the day! The biggest challenge we faced (and are still facing) is the integration of doofieBot into the Facebook Messenger Platform, slowed down by the daunting task of implementing an SSL server against budget & time constraints. Looking forward, we are still looking to make better use of Google Firebase in order to properly implement the integration. Aside from that piece of unfinished work and some more considerations we have in the future for a better web UI, this was a great project overall & we are very proud of the pipeline that we have designed and executed in the span of 30 hours. Worked on the chat interfacing and the backend of the Slackbot. Deployed the Flask application to AWS and used the Slack Python SDK, IBM Watson API and Yelp Fusion API to link our project together. Work on API calls to IBM Watson's Visual Recognition API and Yelp API and parsed the JSON result to display necessary information. Also wrote Python scripts to allow chatbot to output desired information. A CS student at the University of Toronto, and a passionate web developer who loves to build web apps with Angular 6, Ruby on Rails. Worked on integrating DOOF-bot with Facebook messenger chatbot powered by IBM Watson's visual recognition API, using SSL provision by Google Firebase.